This is a partially sponsored post. All thoughts and opinions are my own. I can honestly say that skincare has grown to become one of the most important aspects of my daily routine. While inner beauty is just as important, what you put on your face will make you or literally break you (I’ve been there already, trust me). 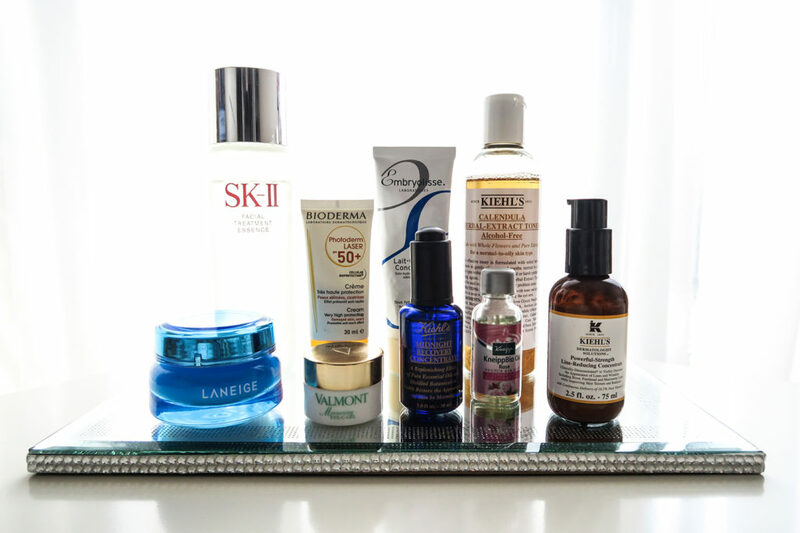 After dealing with a traumatic few years battling acne, I experimented heavily and tried loads of products. I still continue to experiment for the ultimate skincare routine, but what I have now works pretty well with my breakout-prone skin. 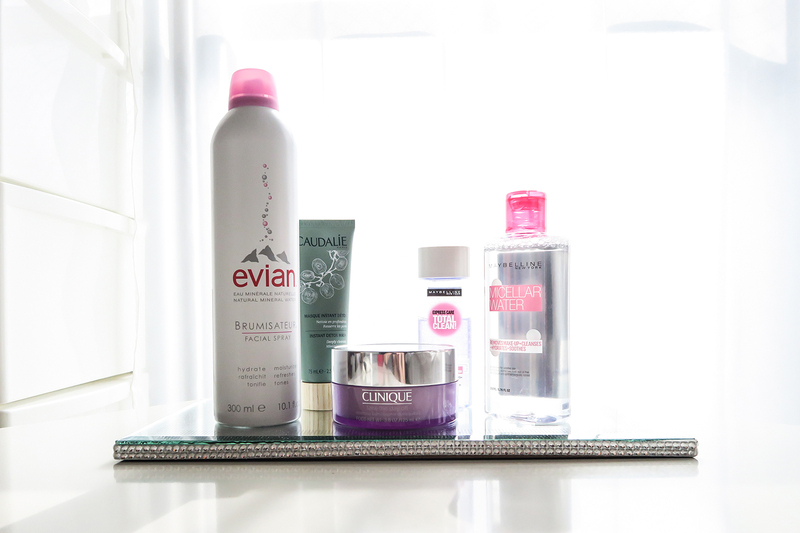 Read on to see which products I use for my day and night skincare routine. *Please note that results will vary for each person when using the following products. If you try a new product, I advise reading the ingredient label carefully, as well as doing a patch test. Toner – Toning is the most important step after cleansing (check out my post on cleansing here). You essentially clean up any residue that is left on your skin after you wash your face. I’m currently using Kiehl’s Calendula Herbal-Extract Toner (Alcohol-Free), which is said to be gentle enough for all skin types. Using a cotton pad, I gently wipe my face and neck. Essence – This is a very popular step in Korean skincare, and since I’m such a skincare junkie, I had to give it a try. I actually started with the Tony Moly dupe, but one of my friends gave me a sample of the SK-II Facial Treatment Essence and my skin just loved it. What an essence essentially does is add another layer of hydration that is more lightweight than a serum, and should be applied after toning the skin. Even though the SK-II essence is probably the most expensive one out there, it’s definitely worth every buck for me and it’s one of those things that will make a difference with continued use. I take a quarter-sized amount in my hand and apply all over my face. Serum – AKA anti-aging. I’ve gone though several bottles of Kiehl’s Powerful-Strength Line-Reducing Concentrate, and while I do use it for the anti-wrinkle benefits, I feel like my makeup goes on better after I apply this. A little goes a long way. Facial Oil – I use two different ones for day and night. In the morning, I put a few drops of KneippBio Oil (Rose) in the palm of my hand, rub it for added warmth and apply all over my face, making sure it seeps into my skin. I remember picking this up one day to try, and my skin reacted so well to it. I love how it smells, too. 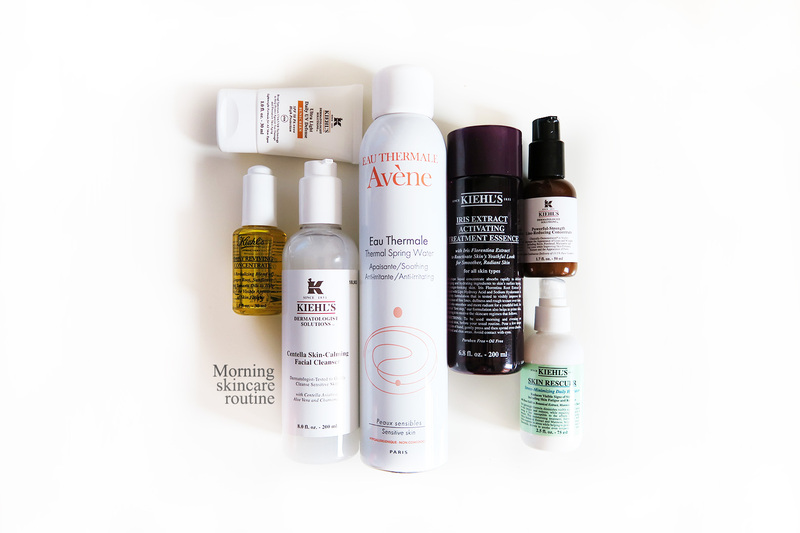 For nighttime, my go-to is Kiehl’s Midnight Recovery Concentrate, a mixture of lavender essential oil, evening primrose oil, and squalene, to name a few key ingredients. This serum/oil helps restore skin’s texture overnight for a fresher, dewy look in the morning. I love how lightweight this one is and how smooth my skin feels in the morning. Eye Cream – I recently just started using the Valmont Eye Gel Cream, and the area around my eyes felt so much smoother, so much more plump after use! Valmont is a luxury skincare brand based in Switzerland, and they finally opened a store at GINZA SIX in Tokyo. Another more affordable option I like is Kiehl’s Creamy Eye Treatment with Avocado. Very moisturizing! Moisturizer – This is the trick to seal all the goodness of the previous products in. My current favorite moisturizer for day (also a favorite for many makeup artists I’ve worked with) is the Embryolisse Lait-Crème Concentrè. It provides much-needed moisture without feeling heavy, and also doubles as a primer for makeup application. For nighttime, I indulge myself in Laneige Water Bank Moisture Cream. This product actually won the Allure Best of Beauty Award in 2016 (!! ), and is a great face cream to help retain moisture for ultra-hydration. Over the years, I’ve learned not to skimp on the moisturizer, especially when your skin is thirsty! Sunscreen – If I can recall correctly, sunscreen is the very first skincare product I’ve ever used. Thank goodness my mother strongly suggested I use sunscreen or moisturizer with SPF on a daily basis since I was eleven. If someone ever asks me for skincare advice, this is the number one thing I recommend. 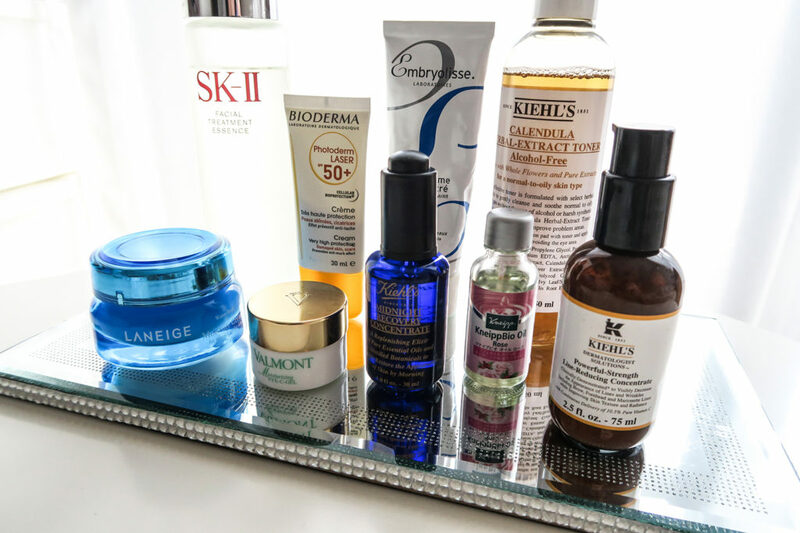 I’ve used different high-SPF sunscreens from La Roche-Posay, Kiehl’s, Neutrogena, etc., but I currently use the Bioderma Photoderm Laser SPF 50+ as my last step before moving on to makeup. I picked this up during my trip in France last year, and it’s supposedly good for hyper-pigmented skin (like mine), and for dark spots/scars. Did you find this blog post helpful? Have you ever tried any of the products above? Let me know in the comments! Toning is so important in my skincare routine too. I swear by witch hazel – it works wonders! i have been dying to try the SK-II facial treatment essence! need to get my hands on that one next 🙂 thanks for sharing your faves babe! I’m a advocate for great skincare products and a great skincare routine! It is very important to take care of your skin while you’re young so you can reap the benefits when you get older. I’m interested in that Essence product you used. I have to check that out! I don’t think I have actually tried any of these except for the SK-II Facial Treatment Essence which I have been using for so long now I can not even count the years. haha I was in my early 20’s when I started using it. Such a good product. Love these types of posts. Skincare is so important to me too. I always love reading about people’s skincare routines just to see what they use. And my routine is very similar to yours as well and I’ve noticed that adding a serum and essence has really transformed my skin. People are always raving about SKII but I honestly haven’t tried any of their products but that’s on my list! How cool, I have 3 of the exact items you’ve listed here!! The one I am really curious to try is the avocado eye cream and the rose oil! They sound amazing and seem to really do their job as your skin always look beautiful. Thank you for sharing your routine with us. First of all – we’ll done to your mum! I need to be stricter with my 12 year old with SPF. 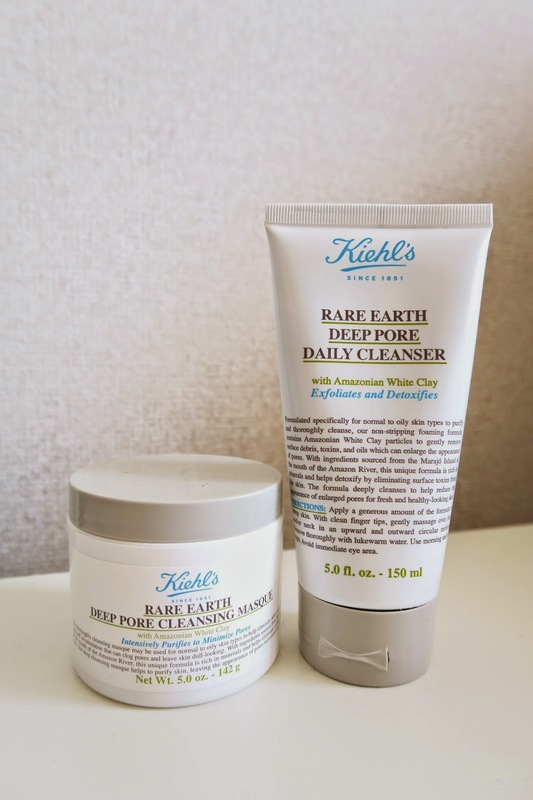 I also love Kiehl’s products and never used essence or oils in my skincare. And I know how you feel about battling with acne – been there!!! I would love to try this Almont eye cream, sounds like it does wonders and Kiehls is on my list as well, I heard nothing but good stuff about their skin care!